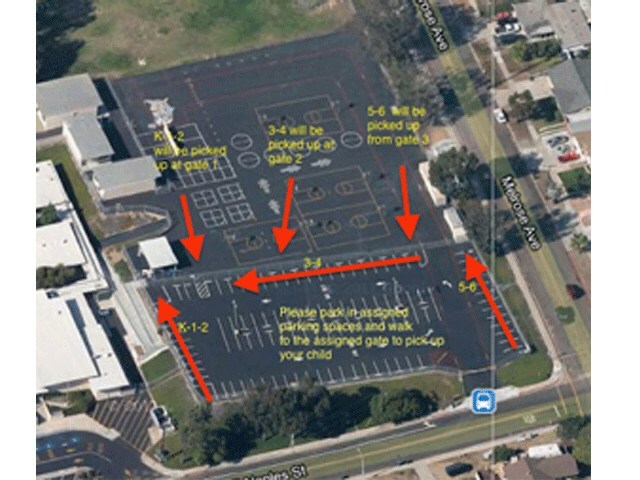 Please review these updated pick up procedures. We ask that EVERYONE follow these guidelines. If we do, pick up will be smooth and fast. Thank you for your cooperation. We have staggered dismissal times for our students to ease congestion. Please do not arrive early. GATE 4 is your gate (the gate along Melrose Dr. near Jamul). Do not come to GATE 2. Your child needs to be classified as a “GATE 4 WALKER”. Do this by notifying the office that your child will be a walker; either in person, by phone (420-0066) or send a note. You may park on the road or across the street to pick up your child. DO NOT park in areas designated “No Parking or Stopping 7am – 4pm”. If you need to cross the street, do so at the stop sign crosswalks. DO NOT cross in the middle of the road. Come at your designated time. If you have an older and a younger student, come at the older student's pickup time. If you are in line and your student is not out yet, you will be asked to park and wait for your child.